Fascination with pop culture never ends. 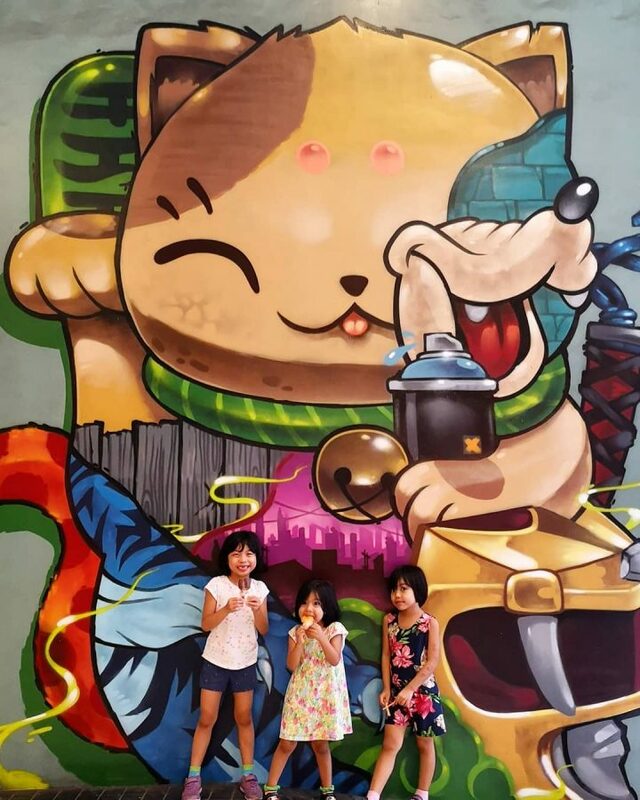 This afternoon we took a moment to check out EXLD’s newest mural at Eastwood City’s mall dropoff. Summer, Emma, and Jo were enjoying Twin Popsies on a pleasantly warm October afternoon. It’s snapshots like this that I hope stick in their memories. Pop culture and street art’s continuous fascination with it are like the angelic voices of a young Justin Bieber or Micheal Jackson. In the case of these musicians, we would hear their young, innocent, angelic voices and be transported back to a time when our own perceptions of love we’re equally as pure and innocent. This activates a unique experience with that music. Similarly, pop culture references transport us back to times when fun was pure too. When we had Saturday morning cartoons, and play was as sweet as a Magnolia Frozen Delight in the tropical sunshine. And I continually hope that street art itself triggers these unique responses in these kids’ memories as they grow older too. That when they come across works like this — new ones that are still yet to be painted 20 years in the future — they too will be transported back to moments like this when they were 7 and 6 and 4 years old. Moments where hopefully they knew and understood that their father was 200% there for them, and loved them with a pure, innocent love.